There is the good, the bad and the wtf wild cards. 2. Increased sales w/in emerging markets due to a greater focus. India saw a noticeable rise in sales. Then, after the increased sales, Apple implemented creative financing to facilitate higher sales. 3. ComScore OEM and Platform share increased for Apple over a three month ave. ending Feb.
4. iOS mobile engagement keeps growing, despite Android market share. 6. The desire for the iPad still dominates. 7. iPads simply dominate usage. 1-7 should bold well for earnings. 4-8 should imply continued success for the June quarter. 1. Kantar survey showed iOS lost some ground three months ending Feb.
2. Due to new financing (via the emerging markets and some US carriers) iPhone ASP may decline, somewhat. (Over the last 4 years, ASP for iPhone has been very stable near mid 600.) Not sure how this will effect eps. We had one end customer, Apple Inc., who purchased through multiple contract manufacturers and represented approximately 91 percent and 70 percent of the Company’s total sales for the third quarter of fiscal years 2013 and 2012, respectively. This same customer represented approximately 82 percent and 62 percent of the Company’s total sales for the first nine months of fiscal years 2013 and 2012, respectively. The biggest concern is that Apple will not meet analyst expectations going into the June quarter. As of today, those expectations are 39.62B for Revenue and 9.28 eps. 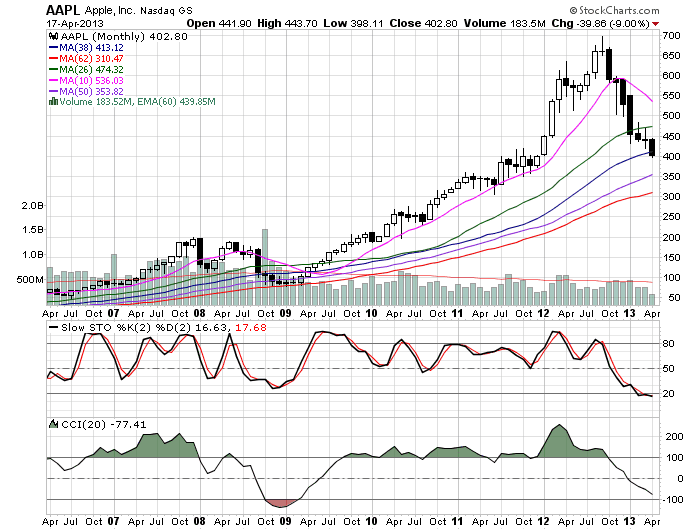 Apple is very very oversold. 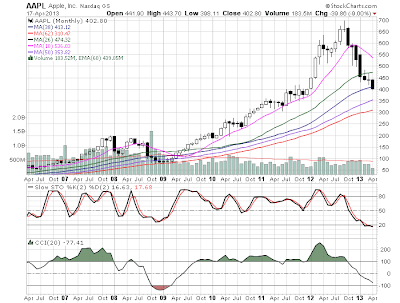 From long-term monthly chart, the last time Apple was this oversold it was during the great recession. If AAPL can't, at the very least, meet expectations then the negative momentum (along with another cycle of negative analyst commentary) may take it for another 100 points. Rational valuation of product-lines be damned. Market Thought... Sell in May?